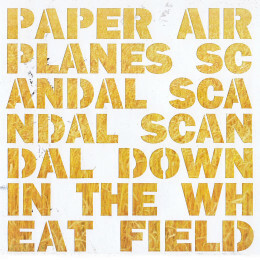 Scandal is the portrait of a band at their technical and creative best. From start to finish, the lyrics provide a narrative of murder and divine justice while weaving their way through the confident arrangements. Within the album’s epic scope lie some great songs, including “Belovedaire”, “Killer Goes to College”, and “Assembly”. After the fifty minute ride it comes to an unsettling finish when our narrator, perhaps delusional, speaks, “you and I seem to do things right, and now everything’s alright.” It’s a fitting closing statement on a record that seems to do a lot of things right. all songs written and performed by Anthony Piazza, Nathan Wilder and Marcus Stoesz.